« Nom, nom, nom, BOOKS! This guest post by Marisa de los Santos over at Planet Books was great. I think all too often, readers are considered “less than” or “not to be taken seriously” for tending towards books that make them feel good. And why shouldn’t they stick with happy endings if that’s what makes them… happy? Where do you fall on the feel-good book spectrum? Read nothing but, avoid them like the plague, read them but they’re guilty pleasures? This postcard appeared on this week’s Postsecret – appropriate, don’t you think? 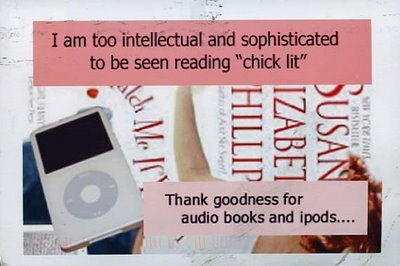 I like to think I walk a happy medium…I love “chick lit” which generally has the Austen-type happy endings, everyone ends up with who they’re supposed to, etc. However, I certainly can appreciate a book that doesn’t end happily ever after just as easily.